The start of the week and we are still down south in holiday mode. Pottering and planning and relaxing a little. The complete (apart from the label) quilt is tested to determine which room it will reside in. The newly painted bedroom wins. Sunset on the verandah is a favourite wind-down spot. 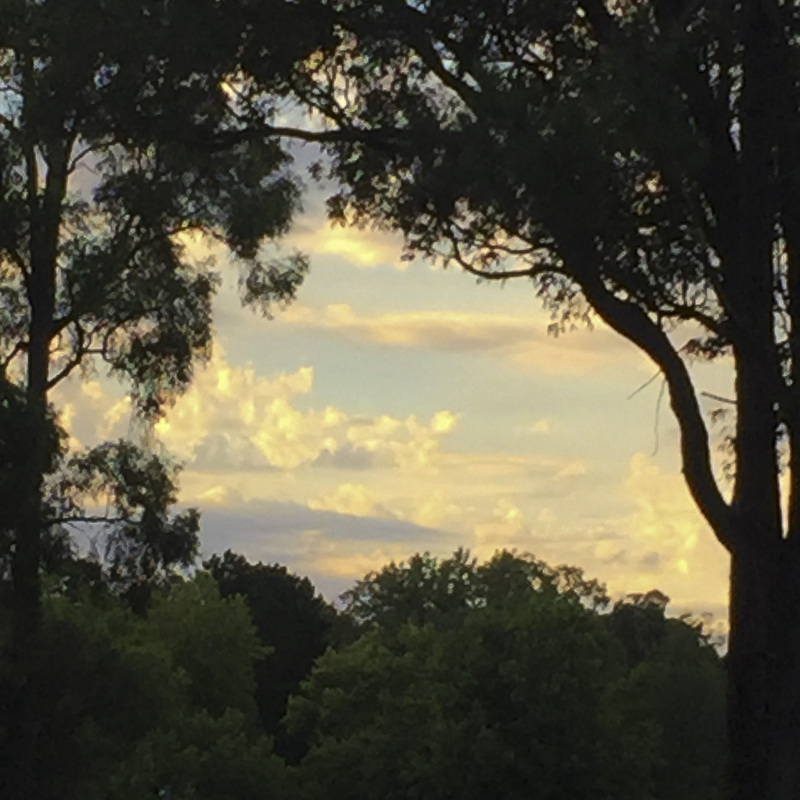 The clouds are ‘framed’ by unusual branches of jarrah and pine trees opposite. Two perfect verticals and a near perfect horizontal with curly jarrah detailing that draws my eye every time I sit there. Beautiful. 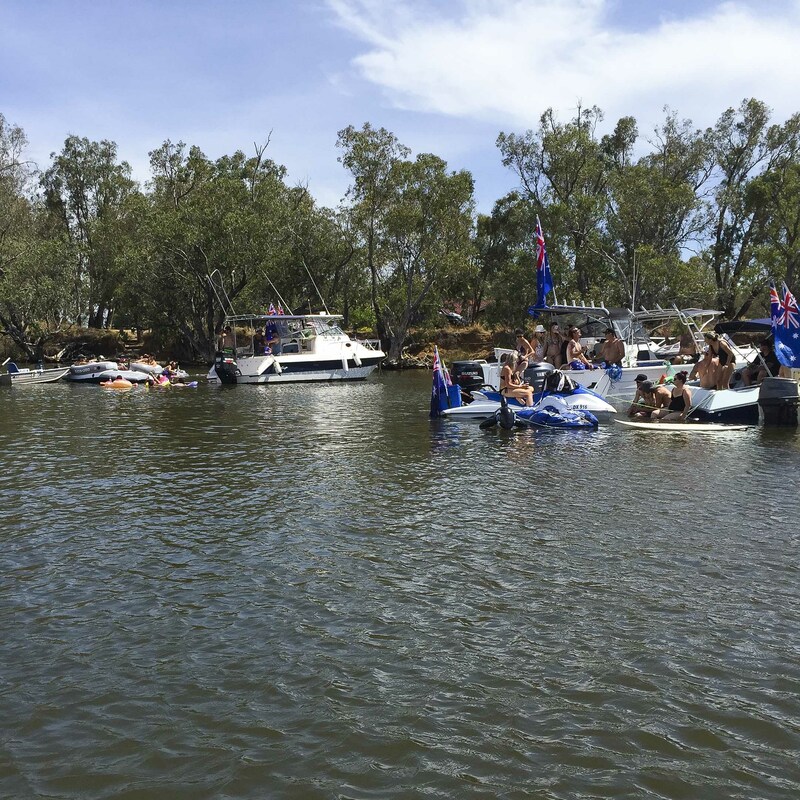 Tuesday is Australia day and we have to head down the hill to an annual lunch on the Murray river at Yunderup. Luckily the weather was kind and not too hot. 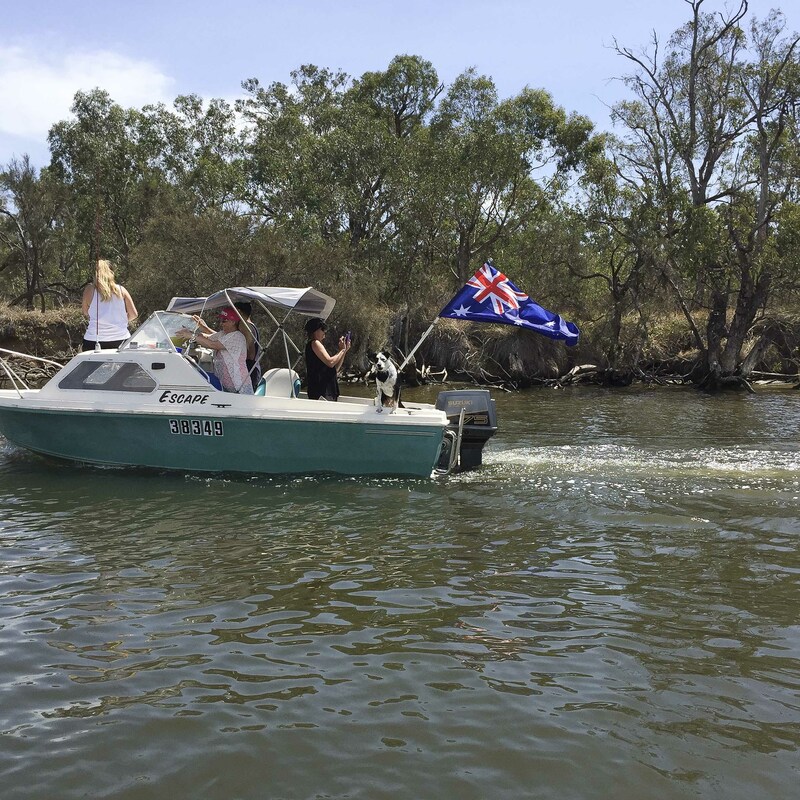 Our hosts took us on the annual chug up the river on their boat and we became part of the passing parade. We’ve only visited on this day every year when all the boats and floaties and flags are out – apparently apart from Christmas day there is no passing parade and the river is quiet and peaceful. 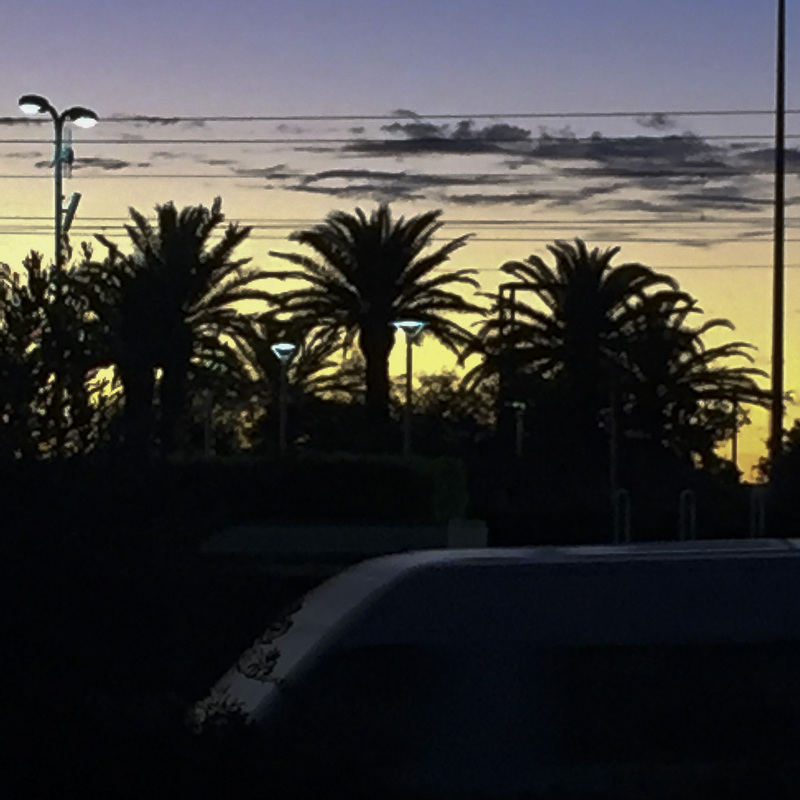 In the evening after a mini family dinner we sit out on our North Fremantle verandah with the view ‘framed’ by power poles and cars. Perhaps not so peaceful – but knowing the beach is just a hop/step away and the train to easily take us north and south it offers us a different type of freedom. On Wednedsay I am back to the studio to get into work mode as quickly as possible. January is almost over and already my inbox is filling in anticipation of a busy year ahead. The week is now very short with two half Esther days to allow the almost due Miff to nest at the sewing machine. On Friday morn Esther and I train it to the Museum in Perth. We have morning tea, visit the wonderful but very busy Discovery Centre, then hit the shops quickly to buy some newborn baby clothes to pile up for the four family babies due. Hairy McClary from Donaldsons Dairy, Dear Zoo, Each Peach Pear Plum, Possum Magic and a newer, darker one – I want my Hat Back. It is lovely to initiate and continue on with family traditions. I make time in between ‘chores’ in this now very short week to work on my next art piece. I finally feel that my work is now clearly concept driven not process driven. 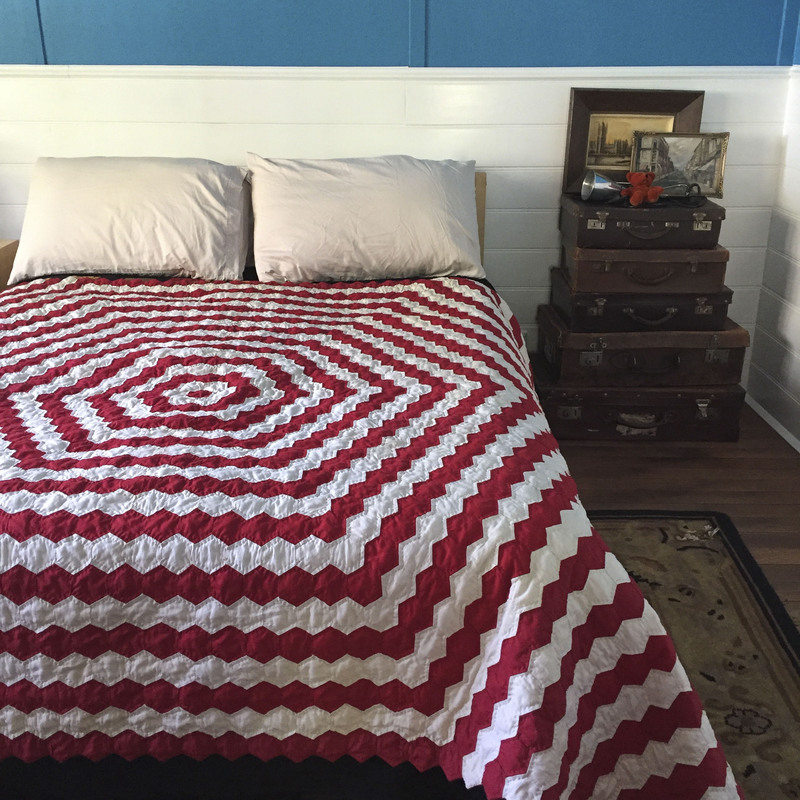 It is hard at the moment to think I can return to the ‘quilt’ – not that I don’t want to – it is just that I need the concept not the technique or definitions to reign at the moment. By Thursday I am working on the border – stitching away so VERY happily I forgot to turn on the music or the radio. I had a list of words to stitch and all of a sudden I went freeform…my mind went into word association mode and memories flooded back and were stitched straight in. I am working on a ‘tablecloth’ and the mostly undecipherable words were to connect elements, form a (hidden) narrative, and form a pattern. I thought and I stitched memories of family, of meals, of time and place, of siblings and doing the dishes and anything connected ….what an amazing ride. I have more to do so who know where I will go this week… perhaps simply back to the radio?